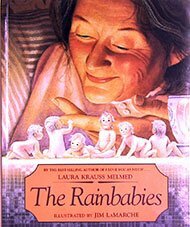 The Rainbabies, story by Laura Krauss Melmed. In the magic of a moonshower, a childless couple finds a dozen tiny babies in a meadow. Written in classic folktale tradition. Ages: Suitable for ages 4 to 8.